KVPY fellows get opportunity to spend some time in scientific institutions attending lectures by experts in different fields of science, engineering or medicine, experience a research environment with science in action, watch scientists at work, interact with scientists, visit nearby scientific research laboratories and institutions, and exchange views with other research students. An Identity Card is issued to each KVPY Fellow. Several national laboratories, universities and other institutions have agreed to extend special privileges like library, laboratory facilities to KVPY Fellows on production of the ID card. Direct Admission in various reputed colleges like, IISER, IISC etc. Stream SA: Students enrolled in 11th standard (science subjects) during the academic year 2015-16 and have secured a minimum of 80% (70% for SC/ST) marks in aggregate in mathematics and science subjects in the 10th standard board examination. Stream SX: Students enrolled in 12th (+2) standard (science subjects) during the academic year 2015-16 and aspiring to join undergraduate program in Basic Sciences (B.Sc/B.S./Integrated M.Sc) for the session 2016 – 17 provided they have secured a minimum of 80% (70% for SC/ST) marks in aggregate in mathematics and science subjects in the 10th standard board examination. Stream SB: Students enrolled in 1st year B.Sc. /B.S. /Integrated M.Sc. during the academic year 2015-16 and have secured a minimum of 60% (50% for SC/ST) marks in aggregate in science subjects in the 12th Standard Board Examination. Stage – 1: Aptitude Test: The written test (multiple choice) is normally conducted in the first week of November at different centers across the country .The venue details of the test are uploaded on the KVPY website in the month of October. Test date for KVPY-2015 is Sunday, November 01, 2015. The test is of maximum marks 100 with 80 questions with negative marking and the weightage of the test is 75%. Stage – 1: Interview: Based on the performance in the aptitude test, short-listed students are invited for an interview which is the final stage of the selection procedure. KVPY – 2015 was conducted on Sunday, November 1st, 2015 for all of the streams. SX Stream: Paper was conducted from 02:00 pm to 05:00 pm and and a total number of 120 questions were asked in two parts. Both part consisted of 4 sections (Physics, Chemistry, Biology and Mathematics). In Part I, each section consists of 20 questions of 1 mark each with 0.25 negative for wrong answer. Candidate was required to attempt any 3 sections out of 4 in Part-I. In Part-II, each of the 4 section consisted of 10 questions of 2 mark each with 0.5 negative mark for wrong answer. Candidate was required to attempt any 2 sections in Part-II. Overall, 80 questions were to be attempted totaling 100 marks. The paper pattern was same as last year. A total number of 120 questions were asked in two parts. Both parts consisted of 4 sections (Physics, Chemistry, Biology and Mathematics). In Part I, each section consists of 20 questions of 1 mark each with 0.25 negative for wrong answer. Candidate was required to attempt any 3 sections out of 4 in Part-I. In Part-II, each of the 4 section consisted of 10 questions of 2 mark each with 0.5 negative mark for wrong answer. Candidate was required to attempt any 2 sections in Part-II. Overall, 80 questions were to be attempted totaling 100 marks. * 80 questions were to be attempted totaling 100 marks. 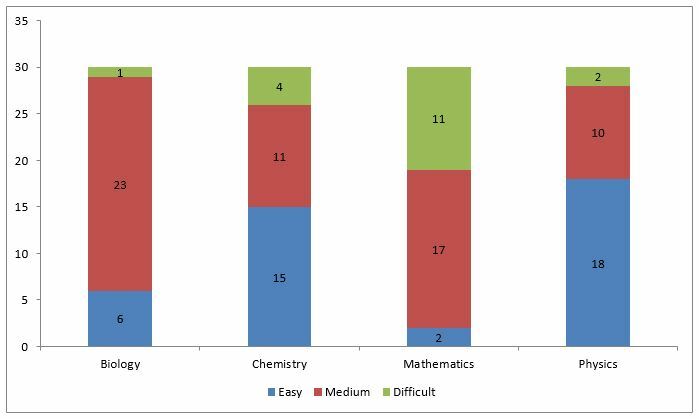 Resonance Experts feel that there was a variance in difficulty of subject papers. While Physics was on easier side compared with Chemistry & Biology, Mathematics was the Toughest. 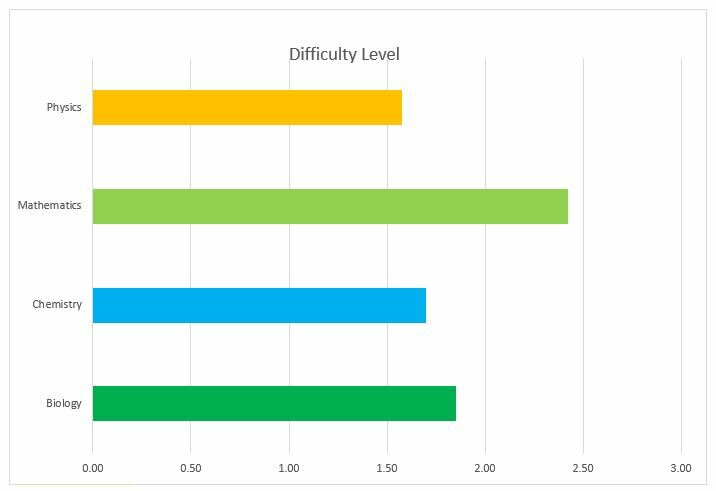 For Students Attempting Mathematics, around 41 Marks can be considered easy overall, 50 marks are relatively difficulty and 29 marks are considered difficult by Resonance Team. 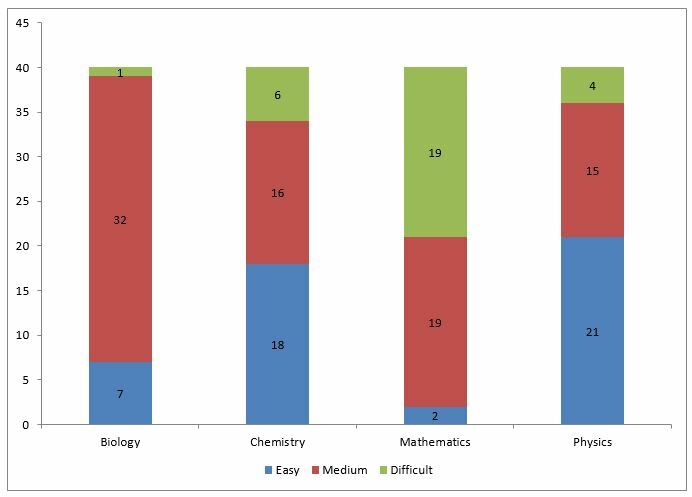 For Students Attempting Biology, around 46 Marks can be considered easy overall, 63 marks are relatively difficulty and 7 marks are considered difficult by Resonance Team. Overall, it is felt that while paper is moderately difficulty, the cut-off may remain same as previous year. Starting from 2006, Resonance has registered continuous growth in number of selections in KVPY year after year. Resonance is India’s leading coaching Institute which offers Classroom Coaching Programs for preparation for various Medical Exams like AIPMT/AIIMS along with JEE Advanced, JEE Mains, KVPY and various National/International Olympiads.